Based on the work of Jean Piaget, the High/Scope educational approach views children as active learners, who learn best from activities they plan, carry out, and reflect upon. The role of the teacher in the High/Scope approach is to plan activities based on the children’s interest, facilitate learning through encouragement, and engage in positive adult-child interaction strategies. The concept of active learning comes from the belief that children learn from personal interaction with ideas, direct experiences with physical objects, and application of logical thinking to these experiences. The components of active learning are manipulation, choice, language and support. The materials typically found in a High/Scope preschool are manipulated by children in a “hands on approach,” not teacher directed approach. As children are actively involved with materials, support from the teacher helps children to express what they are doing and further develop and refine their language and cognition skills. The High/Scope educational approach supports active learning through a daily routine largely made up of plan-do-review, in addition to other activities described. During the planning process children use language to make a choice about the materials they are going to work with, which provides for a consistent time to express their choice, build on their own interests, and recognize themselves as individuals who act on decisions. Work time allows the children to carry out those plans with the support of the teacher to encourage, extend those ideas and provide opportunities to solve problems. Clean-up time is naturally integrated into the plan-do-review cycle at the end of work time. At this time children return materials to their labeled places on open shelves. The other elements of the High/Scope daily routine are small group time and circle time. Small group may be used to develop closer relationships between teacher and children in which the teacher plans the materials for small group and begins the session, but leaves the remainder of the time to the children to explore the materials in an open-ended fashion. The framework or curriculum piece to the High/Scope approach is based on the key experiences – which guide the teacher in supporting and extending the child’s development. Such key experiences include creative representation, language and literacy, social relations and initiative, movement, music, classification, seriation, number, space, and time. The space and materials in a High/Scope setting are carefully selected and arranged to promote active learning. The school is divided into interest areas organized around specific kinds of play. For example, a center might include separate areas for block play, art activities, house play, small toys, computers, books and writing materials, and sand and water play. In each area materials are organized so children can get them out easily and put them away independently. High/Scope teachers are trained to participate as partners in children’s activities rather than relate to children primarily as managers or supervisors. High/Scope training emphasizes positive interaction strategies: sharing control with children, focusing on children’s strengths, forming authentic relationships with children, supporting children’s play ideas, and adopting a problem-solving approach to social conflict. 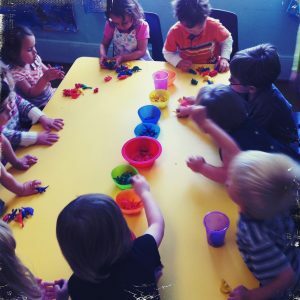 High/Scope preschool teachers provide experiences and materials that help children develop the broad language and logical abilities that are the foundation for later academic learning. For example, to encourage children’s beginning reading and writing skills, teachers create a print-rich environment and provide opportunities throughout the day for children to listen to stories, explore books and other print materials, and work with writing tools and materials. To promote math abilities they provide materials that enable children to use beginning skills in counting, comparing numbers, and one-to-one correspondence. Teachers use the High/Scope key experiences in language and literacy and number to help them recognize and support the learning opportunities in these important pre-academic areas. Teachers use High/Scope’s key experiences in creative representation and music to highlight ways they can support the important abilities children are developing in these areas.